Place Romesco Sauce ingredients in blender. Cover and blend on high speed 1 to 2 minutes or until very smooth. Set aside. Heat gas or charcoal grill. Cut 4 (18x12-inch) sheets of heavy-duty foil. Spray with cooking spray. In medium bowl, mix chicken broth and instant rice; stir and let stand about 8 minutes or until most of liquid is absorbed. Stir in 2 tablespoons of the melted butter and the oregano. Meanwhile, in large bowl, mix remaining 1 tablespoon melted butter, the 1 teaspoon smoked paprika and the 1/2 teaspoon salt. Add chicken, and turn to coat. Place chicken breast on center of each sheet of foil. Spoon rice mixture evenly around each chicken breast. Dividing evenly, spoon sauce over each chicken breast. Bring up 2 sides of foil so edges meet. Seal edges, making tight 1/2-inch fold; fold again, allowing space for heat circulation and expansion. Fold other sides to seal. Place packs on grill over medium heat. Cover grill; cook 10 minutes. Rotate packs 1/2 turn; cook 9 to 11 minutes longer or until juice of chicken is clear when center of thickest part is cut (at least 165°F). Remove packs from grill; cut large X across top of each pack. Carefully fold back foil. Top with almonds, orange peel and olives. To make in oven, place packs on cookie sheet. Bake at 375°F 35 to 40 minutes or until juice of chicken is clear when center of thickest part is cut (at least 165°F). Add toppings as directed above. To remove peel from oranges, use a bartender’s channel zester or microplane. 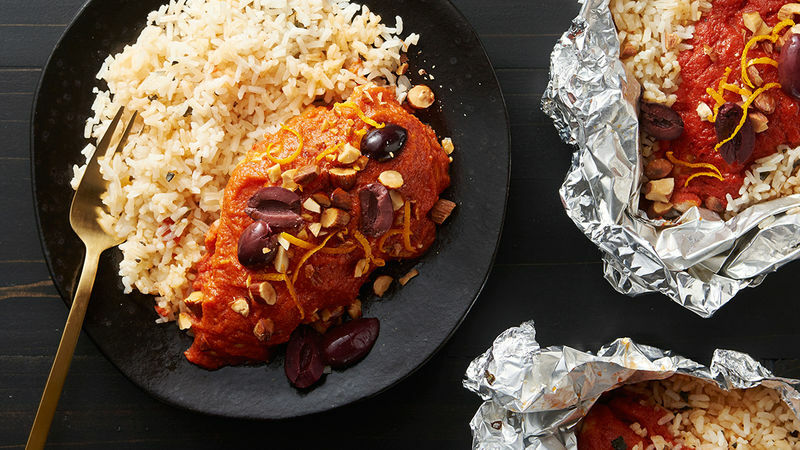 Love the flavor of the Romesco Sauce? It’s also delicious served over fish, lamb or vegetables.